07/01/1999: Area code 267 was created as an overlay to area code 215. The two area codes serve the same area. Area code 267 is an overlay area code for area code 215. The two area codes serve the same area. Area code 272 is an overlay area code for area code 570. The two area codes serve the same area. 02/01/1998: Area code 724 was created as an overlay to area code 412. The two area codes serve the same area. 08/17/2001: Area code 878 was created as an overlay to area code 412. The two area codes serve the same area. Area code 484 is an overlay area code for area code 610. The two area codes serve the same area. 10/21/2013: Area code 272 was created as an overlay to area code 570. The two area codes serve the same area. Area code 570 is an overlay area code for area code 717. The two area codes serve the same area. 06/05/1999: Area code 484 was created as an overlay to area code 610. The two area codes serve the same area. 12/05/1998: Area code 570 was created as an overlay to area code 717. The two area codes serve the same area. 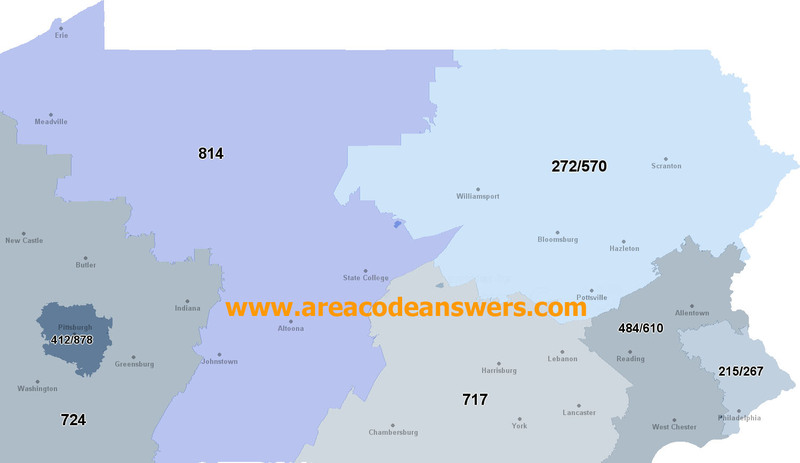 Area code 724 is an overlay area code for area code 412. The two area codes serve the same area. Area code 878 is an overlay area code for area code 412. The two area codes serve the same area.